PowerStores offers the most competitive pricing in the US, and in the world. DON'T WANT TO BUILD YOUR SITE YOURSELF? THAT'S OK! based on your brand's style and colors, with your input and direction. Your website will be ready within 30 days from purchase, provided you deliver all your content and requested files within two business days and that you respond promptly to all approval requests and other email enquiries from our team. create a custom plan that best fits your needs. Contact us at support@powerstores.com or (844) 932-9273. No. 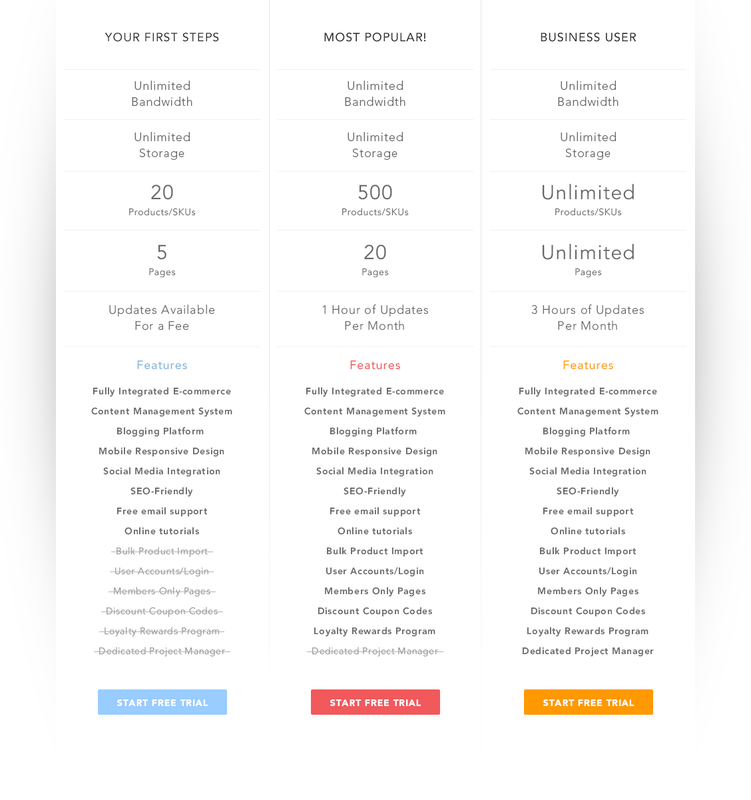 If you want to build your site yourself, there are no upfront or hidden fees. You only pay for the monthly service. We do also offer website setup services with our professional designers - if you prefer that option, choose from one of our setup packages listed above. Yes, we offer a free trial with no obligation. Try it now! Do I need to enter my credit card to sign up? No you don’t! You can try PowerStores for 15 days free without giving any credit card or payment information. If you decide not to go ahead, you will not be billed and you will have no obligation to continue. Will you help me set up my store? Yes. You have two options for help. We offer free support by phone, online chat, or email, to answer any questions you may have and to provide assistance if you get stuck. 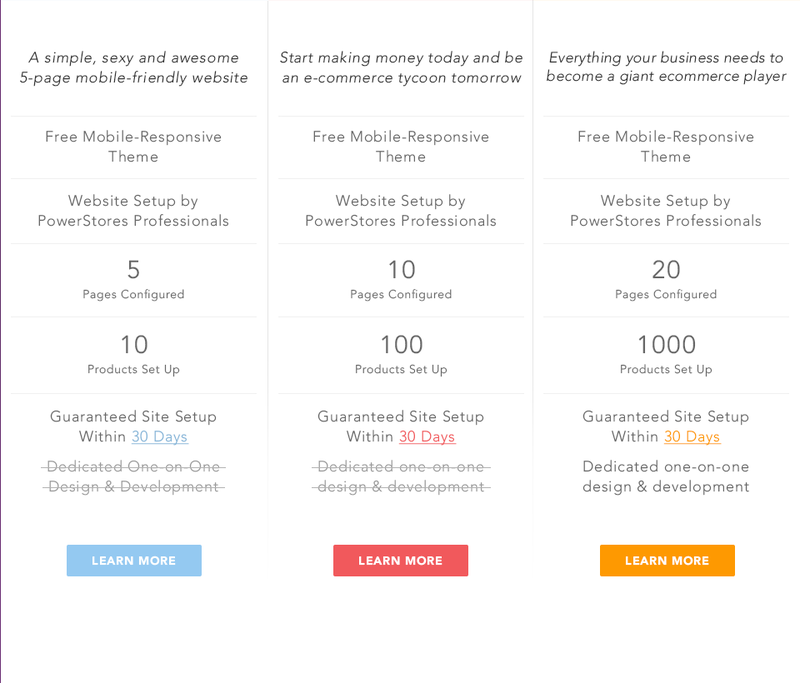 We also offer setup services where we will completely design and build your site for you. Choose from one of the setup packages listed above. It depends. You don’t have to decide now. You can sign up for a free trial without choosing your plan yet. A PowerStores representative will contact you and advise you on which is the right plan for you, based on your business and requirements. How do I accept payments from my customers? PowerStores has partnered with PayPal and Stripe to handle your customer payments. With either payment gateway, you can accept all major credit cards and debit cards from customers all over the world. For more information, visit our payment gateways page. You don’t pay anything for the free trial. If/when you are ready to become a PowerStores customer, you can sign up for a monthly subscription using your debit or credit card. What are your payment terms? Am I expected to pay monthly or yearly? You can pay monthly, or for six or twelve months upfront. Pay 6 months upfront, you’ll get a 10% discount; pay 12 months and get a 20% discount. Yes. We offer a 10% discount when you pay for 6 months upfront, and a 20% discount when you pay for 12 months upfront. Do I need my own domain name (URL) to set up a store? No, you don’t need to have a domain name yet. When you sign up, your site will have a URL such as yourstore.powerstores.com. When you are ready to launch your site, you can move your online store to your own domain. Can I cancel my account at any time? Yes. Just contact your PowerStores representative or email support@powerstores.com if you wish to change or cancel your plan. Can I change my plan at a later date? Yes! No problem, just contact us and we can upgrade or downgrade your plan at any time. BEGIN MAKING YOUR STORE NOW.